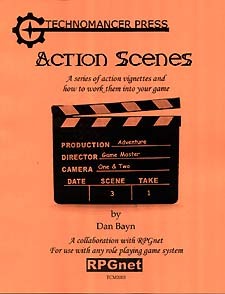 "She rockets up a hill to find her escape blocked not by a wall of men in mirror shades, but by a rose-covered parade float..." Dan Bayn's "Action Scenes" gives you 21 different ways to spin a gaming challenge. Another of our RPGnet collaborations, this set of action essays is just the thing to get you into an RPGing spirit. From 'Clinging to the Side of a Building' up to 'Going to Church', you'll enjoy a fun read and get some good ideas for your next big game.